Really listening to patients and providing empathetic, compassionate care have always been a big part of the UMKC School of Medicine’s physician education. Next week those elements will get an extra boost from National Patient Solidarity Week. The week, Feb. 12-16 this year, is sponsored by the Arnold P. Gold Foundation, a nonprofit organization that promotes patient-centered care. UMKC has had a chapter for 15 years and last month inducted more than three-dozen new members. National Patient Solidarity Week activities are designed to strengthen the bond between patients and their physicians, nurses and other care givers. By increasing such engagement with patients, the program aims to enhance patient and staff satisfaction and improve health care outcomes. For several years, members of the school’s Gold Humanism Honor Society chapter also have delivered roses and Valentines to Truman Medical Center patients on or near Valentine’s Day. And for the past three years, a “Tell Me More” activity during the week has emphasized medical students’ conversations that engage patients on important non-medical aspects of their lives. Answers to some of the questions (such as “How would your friends describe you?”) are written on posters and hung at the head of each patient’s bed, so that everyone on the health care team has the opportunity to relate to patients in ways other than their clinical diagnoses. 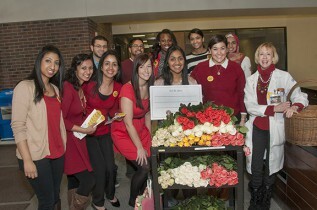 For several years, members of the School of Medicine chapter of the Gold Humanism Honor Society and their faculty sponsor, Carol Stanford, M.D., have delivered roses and Valentine’s cards to patients at Truman Medical Center.